Although Wednesday's meeting of the Sacramento Transportation Authority was billed as a workshop where no decisions would be made, by most indications, the board of directors is moving toward placement of a countywide sales tax increase on the November ballot. The one-half cent countywide tax increase measure that the STA board is contemplating placing on the November ballot would be used for a variety of maintenance needs and infrastructure capital improvements projects throughout the municipalities and unincorporated areas in Sacramento County. Though not formally named, the initiative has been dubbed Measure B. During a presentation made by Alex Evans of EMC Research on polling, directors were told early results showed voters were favorable to approving Measure B if the proceeds were used for so-called "fix it first" projects. Evans said his research shows the measure has a current support level of 69-percent, which slightly exceeds the 66-percent approval threshold needed. Sacramento City Council Member Steve Hansen asked Evans if the prospect for approval would be better during the 2018 mid-term elections. "2016 is about your best opportunity," Evans replied. "You probably have a couple point advantage." During public comment, the board heard a variety of suggestions from governmental agencies, advocacy groups, and individuals representing conflicting interests on how the money should be used if the measure is approved. While most speakers supported the measure in general terms, there was one Carmichael resident who opposed the proposal. "I am against this," Evan Shay said. "I am taxed enough." Among the several governmental representatives speaking were the Southeast Connector Joint Powers Authority's Executive Director Tom Zlotkowski, who said the funding from the measure will be crucial for the 35-mile road connecting Elk Grove to Folsom. Conversely, stressing the "fix it" component of the proposal, Sacramento city Public Works Director Jerry Way noted the city has $150 million in deferred maintenance, and that street conditions are rapidly deteriorating. "We are just adding slurry to our streets," he said. Mike Barmbaum of Ride Downtown 916 said he supports the measure, but said greater funding is needed for Sacramento Regional Transit Light Rail projects and other mass transportation systems. "It [mass transit funding] doesn't go far enough," Barmbaum said. For the measure to be placed on the November ballot, the STA board of directors, which includes Elk Grove Mayor Gary Davis and Council member Pat Hume, will need approvals from four of the cities in the County and the Sacramento County Board of Supervisors. 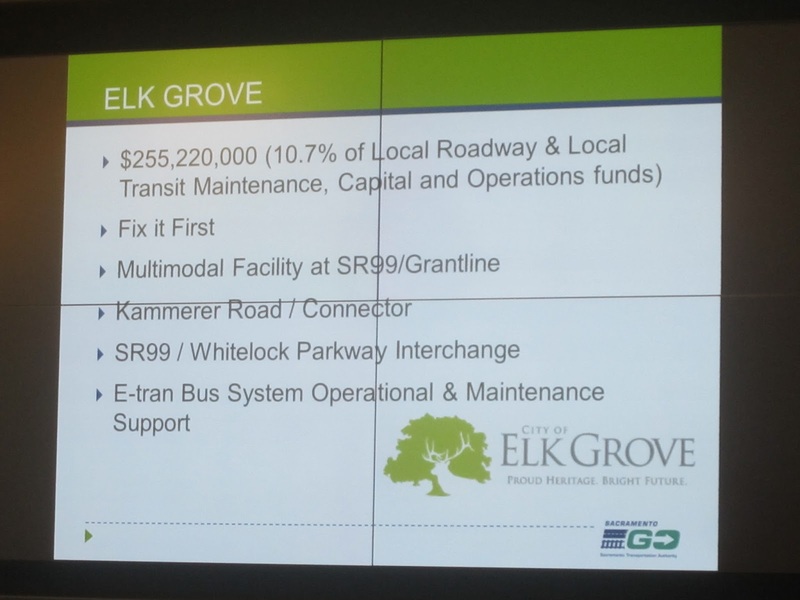 If voters approve the measure, it is estimated that $3.2 billion in taxes will be generated over the 30-year term of the tax with Elk Grove receiving about $225 million. The STA's next meeting is scheduled for April 14 at which time the board is expected to consider a campaign expenditure plan for placing the ballot on the November ballot. It looks like an interesting political battle brewing: Using the sales tax money for the urbanized areas needing infrastructure renovation versus the greedy land grabbers pushing for urban expansion and new infrastructure. Sounds like a bunch of hucksters trying to figure out how to woo the voters and at the same time, acting like children fighting over a new toy and forgetting their childhood lessons about how to share. From my vantage point, I see politicians who failed to manage our finances and commit adequate long term investment into infrastructure; and allowing the urban sprawl land interests to convince us that taxpayers should pay for new infrastructure that will add value to their land holdings, while stimulating the economy with rooftops and minimum wage retail jobs. All I see are a bunch of Emmett Kelly politicos with their pockets turned inside out with sad expressions saying we need help. The tears of clowns. Well said Anon. 12:30 and not a tear in my eyes as I vote NO!